One of the nice things about miso soup is that you can use whatever ingredients are in season at the time. 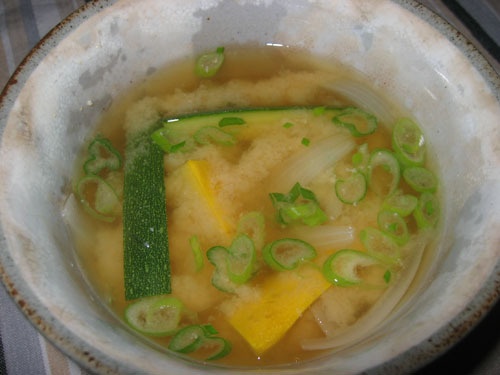 With zucchini or courgettes in season now, I have been enjoying zucchini and onion miso soup with my breakfasts. Bring the dashi, zucchini and onion to a boil in a small sauce pan. Simmer until the zucchini and onion are cooked. Add the miso back to the soup. Pour the soup into a bowl and top with green onion. I don’t know why but whenever I’ve used miso it just hasn’t tasted great. I want to use it as I think it’s healthy and like you say you can change what you put in it.